There has been growing interest in the Online Program Management (OPM) market, as more schools try to develop a strategy and revenue model for online programs (particularly for master's level), and as 2U continues its rapid rise in the stock market (with a nearly $4.8 billion market cap). Typically the description of this market is that the total annual revenue is somewhere between $1.5 - $2.5 billion and that it is growing. The implications are that we have a land grab as companies get rich off the new programs. This is not an easy market, as many programs take millions of dollars of investment by the OPM provider before an account becomes profitable, often 3 - 5 years down the road. 2U's Semester Online initiative, targeted at the undergrad market as a consortium, shut down in 2014 due to the departure of several founding member institutions and due to low enrollment. Later that same year Cal State Online shut down in all but name, along with its usage of Pearson as its OPM partner. In 2015 Synergis Education pulled out of its work with USC's Master of Integrated Design, Business and Technology program, to be eventually replaced by 2U. In 2016 the University of Florida Online (UF Online) canceled its contract with Pearson and pivoted to a new approach not using an OPM partner. After raising $230 million from Bertelsmann in 2015, HotChalk has failed to bring in any new clients of the scale of Concordia University, and in 2016 the company paid a $1 million settlement (though not admitted any fault) based on a federal investigation and lawsuit. Sometime in 2016/17, the nonprofit OPM Educators Serving Educators from Excelsior College shut down. In 2017 after a management shake-up, DeVry Education Group (now Adtalem) pulled out of the OPM market and got rid of its Integrated Education Solutions group. In late 2017 the Eastern Michigan University's chapter of the American Association of University Professors filed a complaint against EMU's contract with Academic Partnerships, although an arbitrator sided with the school earlier this year. Also in late 2017 Greenwood Hall - a call center-based fee-for-service OPM provider - collapsed in dramatic fashion, with AnswerNet eventually buying the remaining assets. There has been growing pushback on the mainline revenue-sharing model, where full-service OPM providers make 50% or even more of tuition dollars from online programs. This has led to the rise of unbundled, fee-for-service category of OPM providers. The picture one gets is of a chaotic market that is not for the faint of heart, and one that will likely see further consolidations and category changes. 2U, for its part, has been successful partially due to a niche strategy where they go after elite master's programs and mostly avoid direct competition or engagement with the rest of the market. And recently we have started to see the MOOC providers become OPM providers - where the primary revenue for Coursera and FutureLearn are based on revenue sharing with online programs, albeit with lower sharing rates and with very different marketing approaches. In other words, there seems to be several efforts to enter into the same OPM race, but if possible to avoid being in the mainline rev-share OPM market. The Toecutter would feel right at home. Not even represented here is the movement of former for-profit institutions (e.g. Grand Canyon University, the parent company of Kaplan University) becoming OPM providers. This means that our landscape view of the market is temporal in nature - expect more shake ups and category changes as the OPM market continues to grow in new ways. As education evolves to take advantage of online technologies and processes, early business models evolve too. What indeed looks like market chaos, is just unfinished change. What still needs to evolve in these markets are the harder, more cultural aspects of this progression, and in particular their influencing of both education practice and business. In terms of education practice, most institutions still need to adjust their teaching and learning methods and cultures to include successful distance learning practice. This mid-long term adjustment might start with some classic barriers removal (Cho, Berge and Muilenburg) followed by a greater appreciation of the value in developing good quality reusable learning materials of equivalent value to human course components. It should also recognize the value that experienced external partners bring, when helping catalyze and referee such cultural change. 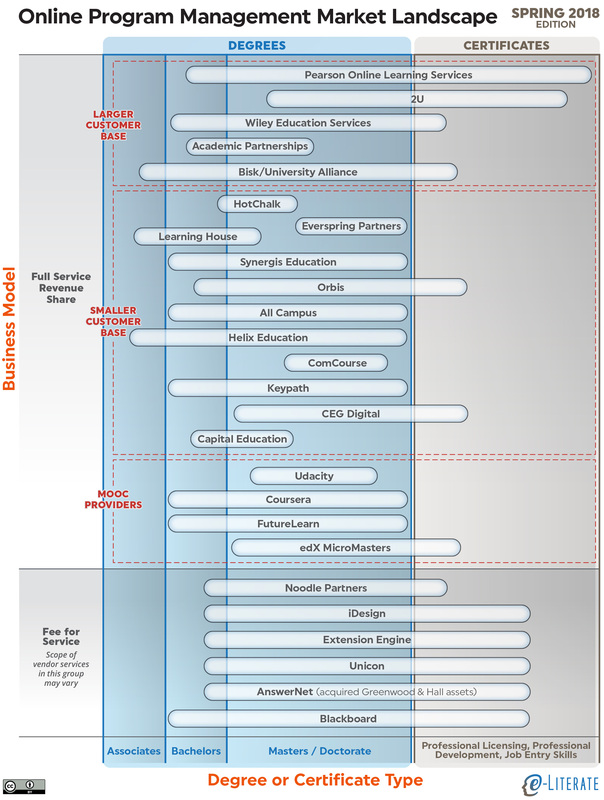 In terms of education business evolution, early exploitative models are now unappealing. Business models that successfully help an institution to enable its own online education business capability, are out there. Good ones were devised in-house, and perhaps spun-out by innovative academics after pioneering effort. Heriot-Watt’s Global MBA and the University of London’s/ACCA joint Masters in Professional Accounting are two UK examples of such long-term online success. 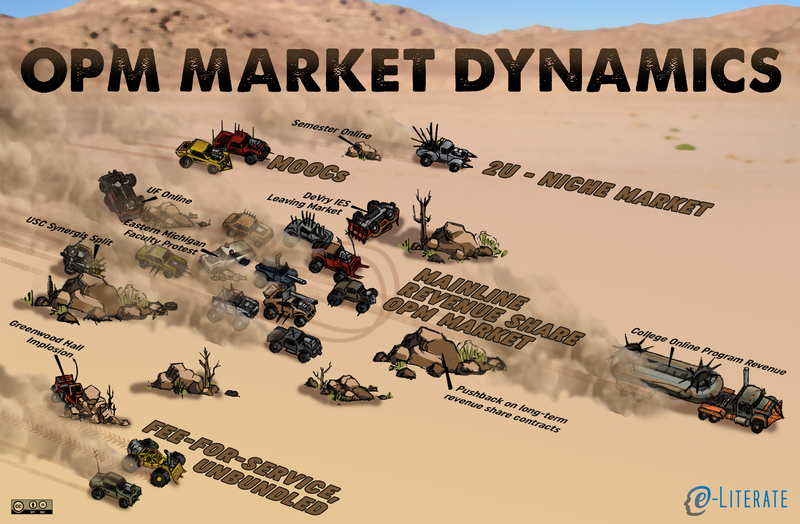 As the OPM market continues to evolve and races to embrace the majority, my Mad-Max attention is focused on the fee-for-service, unbundled players. This where long-term partnerships of true value can be established, where each partner sticks to its strengths and helps the other maintain theirs.